Packsize today announced the new M1™ On Demand Packaging® system, a robust and responsive box-making machine and technology solution designed for speed, flexibility, and reliability. Built upon the Packsize Global Modular Architecture platform and utilizing PackNet® production and optimization software, the M1™ system delivers advanced On Demand Packaging® functionality for packaging environments requiring high variability in box types and sizes. Businesses involved with the shipment of goods where box types and sizes frequently change can now improve the capabilities of their packaging environments. 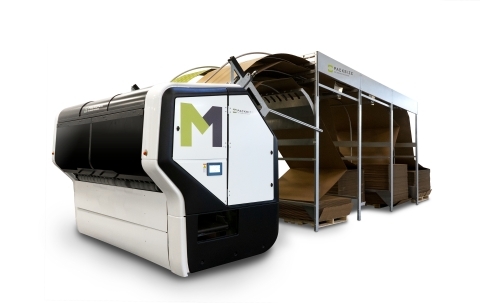 The design of the M1™ draws upon years of Packsize industry experience to maximize the production of right-sized, custom corrugated boxes. This next-generation machine and technology solution features the latest On Demand Packaging® advancements, including the following key capabilities. PackNet® software gives packaging operators the ability to prioritize box production, create workflows, manage multiple machines, integrate with existing ERP and WMS systems, and produce advanced on-demand analytics via a newly improved user interface. The modular design of the M1™ meets global trends for smart manufacturing to provide exceptional reliability, performance, and efficiency for all types of manufacturing businesses, while ensuring production uptime, low energy consumption, and efficient material use. For more information, contact info@packsize.com.